Carols in the Quarter, bonfires on the levee and Celebration in the Oaks set the mood for a New Orleans Christmas along with great food traditions from the past. Predominantly Catholic residents of the 1800s fasted before midnight Mass on Christmas Eve, then brought forth their finest dishes to celebrate until dawn on Christmas at a gathering called Reveillon, meaning “awakening.” French cooking dominated, and local ingredients played a prominent role. Holiday tradition called for breakfast offerings, turtle soup, veal grillades, daube glace, baba au rhum and bouche de Noel. Today, many New Orleans restaurants celebrate the Reveillon meal throughout December with old and new versions of Creole cuisine at usual dining times. Baba au rhum is a classic French yeast cake studded with dried fruit and soaked in rum syrup. It is said to have originated in Lorraine (then German, now French) when the Polish king Stanislas Leszcsynski was exiled there in the 1600s and found the traditional kugelhopf too dry. He improved it by suggesting the addition of rum and named the dish after Ali Baba. A pastry chef attending the king perfected it using a brioche steeped in alcohol, eventually serving it in the Rue Montorgueil in Paris and calling it “baba.” According to “Larousse Gastronomique,” other renowned pastry chefs in Bordeaux and Paris were inspired and created their own versions. You might find one on a menu today in New York or New Orleans, especially during the holidays in December. Or, you might try one for your own table. They can be made a day or two ahead and are not difficult to make, especially if you are used to working with a yeast dough. 1. Place raisins in a small bowl and sprinkle with rum. Set aside. 2. Melt 1 tablespoon of the butter and brush a standard 12-cup bundt pan. Set aside. 3. Place yeast in the bowl of an electric mixer. Stir in the warm milk and sugar, and let this sit for 5 minutes until a yeasty sponge has formed. Add eggs and beat lightly into yeast mixture. Then add flour, salt, zest and remaining butter and blend into the yeast and egg mixture. On medium speed, beat for 5 minutes. The dough will be elastic. In the mixer bowl, shape dough into a ball with a spatula. Cover with a damp cloth and let dough rise for about 1 hour until it doubles in size. A slightly warm space is preferable, such as a barely heated oven that has been turned off. 4. When dough has risen, fold soaked raisins into it and place in bundt pan. Cover again with a damp cloth and let rise for about 45 minutes, until risen almost to the pan’s edges. 6. When baba has risen, uncover and bake for 20 to 25 minutes until golden brown and pulling away from the sides of the pan. Remove from pan immediately and onto a wire rack to cool. You may have to run a knife around the edges before removing cake. 7. Meanwhile, make the rum syrup by heating the water and sugar in a small pot until sugar is completely melted. Remove from heat, cool and stir in rum. 8. 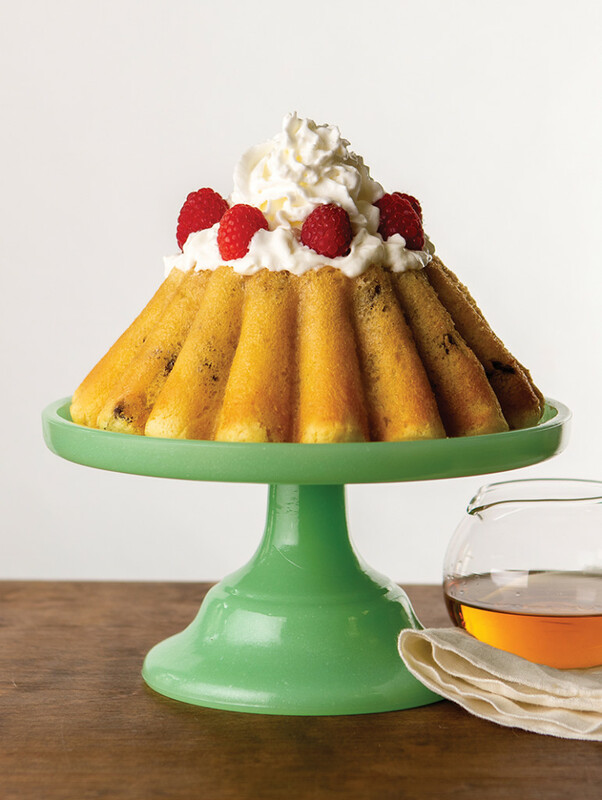 When cake is cooled, place it on a serving plate and spoon rum syrup over cake. Do this in portions to allow syrup to soak in. If not serving immediately, cover and decorate later. 9. To make topping, whip cream until thickened. Add sugar gradually while beating and beat until stiff peaks form. Mix in vanilla. 10. Shortly before serving, fill the center of the cake with whipped cream, spreading extra over the top of cake. Decorate with raspberries. Serve any extra cream and raspberries on the side. Serves 8 to 10. Note: Baba can be served as individual cakes, baked in small ring molds. They are sometimes served over crème anglaise. For a list of restaurants serving Reveillon dinners in New Orleans, go on-line to frenchquarter.com/reveillon-dinners and make your reservations at individual restaurants.